It is a comedy first performed in BC411 in Athens, Greece. It is a masterpiece and still performed all over the world now. The subtitle, Eros in Wonder Land, is a work written by Shuji Terayama with a request from Keita Asari, then a director of Theater Company Shiki ( Four Seasons ) in 1965. It may be called Lysistrata in Terayama Style. However, it was never performed for some reasons. Ryuzanji Show rewrote this in a samurai musical drama in 2014. This time we show you a newborn final piece. Why on earth do men like FIGHTING? To us women, there is nothing more silly and ridiculous than wars, which deprive us of our loved ones, husbands, sons, fathers, brothers, sweethearts and so on. How can we women stop this long-lasting war?.......Oh, how about depriving them of ecstasy of THAT? Never allow them to do THAT! Then they would lose their fighting spirit and give in. This is the promise among all of us women. Nobody can break it! Okay!? Do you think it will work out and the peace will be back? 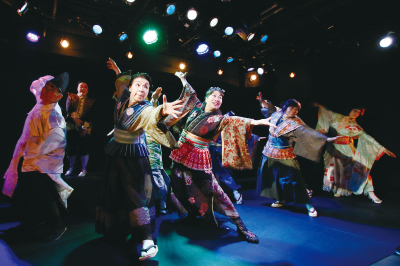 Theater RAKU and restarted as a travelling company. We took part in Victoria Fringe Theater Festival in Canada in 2013 and won the Best Ensemble Award, were invited to participate in Taiwan International Festival in 2015, 2018 and 2019. Our motto: Watching joyful things gives you power and makes you happy!! !